PILOTS BESTS: Most games played (148); most hits (126); most singles (105); most stolen bases (73); most strikeouts (90); most walks (95); most times stealing home (1); most double plays by third baseman (9); most errors by third baseman (10); most putouts by third baseman (70); most assists by third baseman (123). 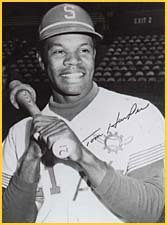 HONORS: All-Star 1965; National League leader runs 1965 (126); American League leader stolen bases 1969 (73), 1973 (54). FACT: Led his Connie Mack team to the national championship.